An iceberg is a large mass of free-floating ice that has broken away from a glacier. 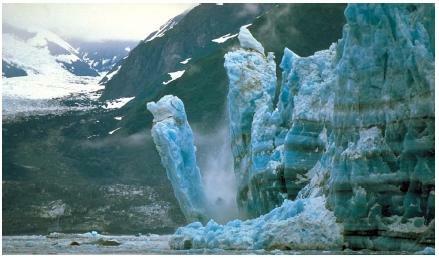 (Glaciers are flowing masses of ice, created by years of snowfall and cold temperatures.) Beautiful and dangerous, icebergs are carried about the ocean surface until they melt. 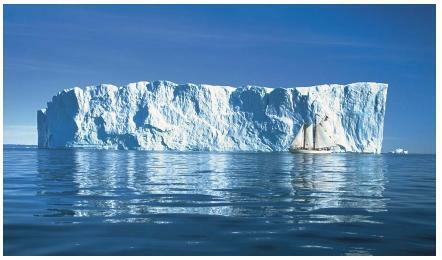 Most icebergs come from the glaciers of Greenland or from the massive ice sheets of Antarctica. The process of icebergs breaking off of a glacier is called calving. Icebergs consist of freshwater ice, pieces of debris, and trapped bubbles of air. The combination of ice and air bubbles causes sunlight shining on the icebergs to color the ice spectacular shades of blue, green, and white. Icebergs come in a variety of unusual shapes and sizes, some long and flat, others towering and massive. An iceberg floats because it is lighter and less dense than the salty seawater, but only a small part of the iceberg is visible above sea level. Typically, about 80 to 90 percent of an iceberg is below sea level. Scientists who study icebergs classify true icebergs as pieces of ice that are higher than 16 feet (5 meters) above sea level and wider than 98 feet (30 meters) at the water line. The largest icebergs can be taller than 230 feet (70 meters) and wider than 738 feet (225 meters). Chunks of ice more massive than this are called ice islands. Ice islands are much more common in the Southern Hemisphere, where they break off from the Antarctic ice sheets. The life span of an iceberg depends on its size, but is typically about two years in the Northern Hemisphere. Because they are larger, icebergs from Antarctica may last for several more years. The main destructive forces that work against icebergs are wave action and heat. Wave action can break icebergs into smaller pieces. It can also force icebergs to knock into each other, which can fracture them. Relatively warm air and water temperature gradually melt icebergs. Calving: Process of iceberg formation in which a glacier flows into the sea and large chunks of glacial ice break free due to stress, pressure, or the forces of waves and tides. Ice island: Thick slab of floating ice occupying an area as large as 180 square miles (460 square kilometers). Ice sheet: Glacial ice that covers at least 19,500 square miles (50,000 square kilometers) of land and that flows in all directions, covering and obscuring the landscape below it. Ice shelf: Section of an ice sheet that extends into the sea a considerable distance and that may be partially afloat. Since icebergs float, they drift with water currents toward the warmer waters near the equator. Icebergs may drift as far as 8.5 miles (14 kilometers) per day. Most icebergs have completely melted by the time they reach about 40 degrees latitude, north and south. There have been rare occasions when icebergs have drifted as far south as the island of Bermuda in the Caribbean, and as far east as the Azores, islands in the Atlantic Ocean off the coast of Spain. One of the best-known icebergs is the one that struck and sank the ocean liner Titanic on her maiden voyage in the spring of 1912. More than 1,500 people lost their lives in that disaster, which occurred near Newfoundland, Canada. As a result of the tragedy, 16 nations agreed to monitor icebergs to protect shipping interests in the North Atlantic sea lanes. Counts of icebergs drifting into the North Atlantic shipping lanes vary from year to year. Some years no icebergs drift into the lanes; other years are marked by hundreds or more. Many ships now carry their own radar equipment to detect icebergs. Some ships even rely on infrared sensors from airplanes and satellites. Sonar is also used to locate icebergs. miles (1,714 square kilometers) of area from the Larsen Ice Shelf calved away. In the fall of 2000, an iceberg measuring 30 by 11.5 miles (48 by 18.5 kilometers) calved from the Ross Ice Shelf in Antarctica. According to some scientists, these highly unusual events could be evidence of global warming. Some people have proposed towing icebergs to regions of the world that suffer from drought. However, the cost and potential environmental impact of such a project have discouraged any such attempts.